While I am not certain if this is still de rigeur in 2012, it was certainly the thing to do as a young girl in the early 1960’s. Easter was not Easter without your Easter outfit. The baskets, colored eggs and chocolate rabbits took a back seat to the fashion statement. When my children were young (in the 1980‘s) my son truly believed he caught a glimpse of the giant Easter bunny rabbit hopping across our lawn in the middle of the night bearing gifts for Easter morning. (I should have known then of things to come.) It was all the rage among our friends back then to give gifts to our children on Easter morning. Barbie dolls, Thunder Megazords…oh, nothing would do other than a Thunder Megazord. And yes, that was in addition to the fancy woven baskets, Cadbury Creme Eggs, chocolate rabbits, jelly beans and various other basket stuffers. There were also rather festive parties which included massive Easter egg hunts. Oh, and don’t forget the Easter trees. Easter trees were an invention of the 80’s and found new and innovative ways to clutter up the attic and wreck havoc on storage closets for all of the Easter egg ornaments and the several foot high tree itself. This holiday had now become almost as commercialized and as anticipated by children as Christmas. Meanwhile, the one constant in all of this dressing up and gift giving over the years was family gathering on Easter, usually following church. Baked ham with the trimmings and a dessert that included coconut was standard fare. Later in life, there was perhaps a leg of lamb or two prepared in place of the ham. The Easter dinner menu was pretty much set. That was just how it was. It was family tradition. We now find ourselves empty nesters. No egg hunts are planned and the Easter baskets are empty. Some of those baskets are now props for photos. The children have their own lives and commitments. So, while our Easter may be a quiet one this year, there are wonderful memories from the past to fill our spirit The years go by quickly, so enjoy every holiday that you have with your children to the fullest. 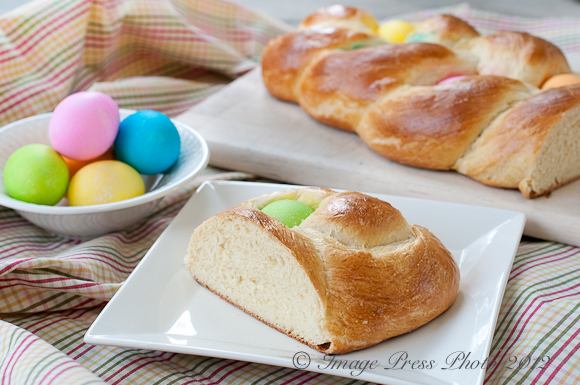 This traditional Easter bread was prepared from a recipe in April 2012’s Bon Appétit. We found the flavor and texture to be a cross between Challah bread and Brioche. The leftovers would be perfect to use in this Bourbon Bread Pudding recipe. Friends often think alike. My friend Lora at Cake Duchess prepared a similar Italian Easter Bread. This festive holiday bread bakes up beautifully and would be a perfect addition to your holiday table. We thought the taste resembled a cross between Challah bread and Brioche. 1. Heat milk in a small saucepan over medium heat or in a microwave until an instant-read thermometer registers 110°–115°. Transfer milk to a 2-cup measuring cup; stir in 1 Tbsp. sugar. Sprinkle yeast over milk and whisk to blend. Let sit until yeast is foamy, about 5 minutes. Add eggs; whisk until smooth. 2. Combine remaining 4 Tbsp. sugar, flour, and salt in the bowl of a stand mixer fitted with a dough hook. Add milk mixture. With mixer running, add 1/2 cup room-temperature butter, 1 piece at a time, blending well between additions. Mix on medium speed for 1 minute. Knead on medium-high speed until dough is soft and silky, about 5 minutes. 3. Brush a medium bowl with some melted butter; place dough in bowl. Brush top of dough with remaining melted butter; cover with plastic wrap. DO AHEAD: Can be made 1 day ahead. Cover with plastic; chill. 4. Let dough rise in a warm, draft-free area until doubled in size, 1–1 1/2 hours (or 2–2 1/2 hours if dough has been refrigerated). 5. Place 5 or 6 eggs in a medium pot. Pour in cold water to cover by 1 inch and bring to a boil over medium-high heat. Remove from heat, cover pot, and let stand for 10 minutes. Transfer eggs to a medium bowl of ice water; let cool completely. If desired, color eggs according to food-coloring package directions, or check out our recipes for dying your eggs naturally. Transfer eggs to paper towels to dry. DO AHEAD: Eggs can be dyed up to 1 week ahead. Cover and chill. 7. Arrange ropes side by side lengthwise on prepared sheet. Pinch top ends together. Braid dough. Pinch bottom ends together to secure (braided loaf will be about 12 inches long). Tuck dyed eggs between braids, spacing evenly. Loosely cover with plastic wrap or a kitchen towel. Let rise in a warm, draft-free area until puffed but not doubled in size, 45–50 minutes. 8. Arrange a rack in middle of oven; preheat to 375°. Whisk remaining egg with 2 tsp. warm water in a small bowl. 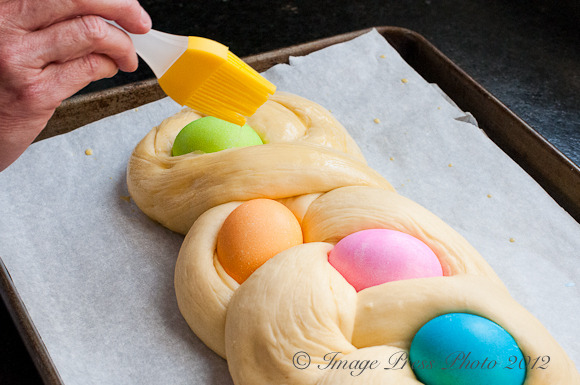 Avoiding dyed eggs, brush dough all over with egg wash. Bake until bread is golden and an instant-read thermometer inserted into center of loaf registers 190°, 20–25 minutes. (*My bread temperature was slightly over 190 degrees at 20 minutes, so I suggest checking it at 17-18 minutes for doneness.) Let cool on a wire rack. Serve warm or at room temperature. DO AHEAD: Can be made 8 hours ahead. Let cool completely and store airtight at room temperature. This reminds me of being little and going to my Italian grandparents’ house for Easter! I love the color of your Easter eggs–did you use natural dye? Thank you for your comment. I did not use natural dye. I wanted vibrant colors for the photos, so I used traditional Easter egg dye. Thank you. Yes, Easter brings back lots of memories. I hope you had a wonderful Easter! Oh, my, that is beautiful and looks delicious! I’m thinking it might be carrot cake for us. Just because there is nothing quite like carrot cake. Our Easter bread is rising as I type – just about the same recipe…. cannot remember an Easter without it! We make one large round one with three eggs to bring to my brother’s home on Easter – and a bunch of small i egg loaves for friends and family (used to write the kids name in white crayon before dying). My husband loved your long braid… we may give that a shot this year. b-e-a-u-t-i-f-u-l… Happy Easter! Thank you for your comment and I hope your bread turns out beautifully. Happy Easter! Hi Gwen – loved the food and fashion memories. Growing up in a large family, Easter was especially exciting because we all got new outfits. Some years my Mom would make our outfits – nothing fancy, but certainly made with love. I hope you had a wonderful Easter. I am happy to know that there were other little girls waiting every year for those new Easter outfits! Funny how that has stayed with us all these years. This is such a fun idea for Easter. It would be the centerpiece on our table. Perhaps I can make this next year as I’m afraid our little Alex might not appreciate it just yet. Your story made me think about how much more I should do to make these holidays more special. Thank you so much!! This is just like my great grandmothers recipe (from what I remember) and I thought it lost. You will forever have my thanks! Ive got two loaves just about ready to go in the oven. Happy Easter! Thank you for the comment. I hope you enjoy the bread as much as we did. Happy Easter! Hi Gwen, Your Easter bread is beautiful! Wish I had time to bake these days. Hope you and yours have a Blessed Easter season. Thank you so much and I hope you and your family had a wonderful Easter as well. Thank you for leaving a comment. I hope your family had a nice Easter. This bread is delightful toasted and the leftovers would make excellent french toast or bread pudding. 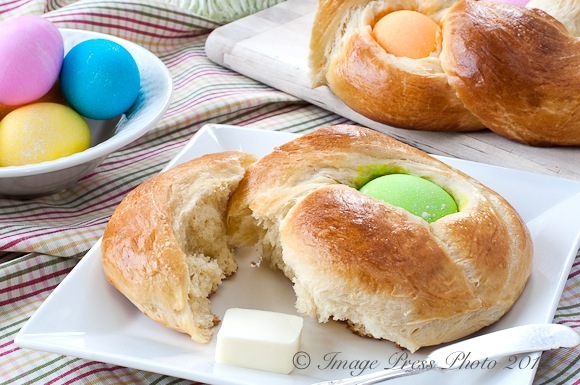 I just commented on Lora’s site that I’ve always wanted to make an Easter bread with colorful eggs tucked in. Yours looks just as gorgeous as hers, and the ‘fluffiness’ factor is perfection. Hope you had a wonderful Easter! Thank you so much. I think it’s too funny that we posted the same bread. 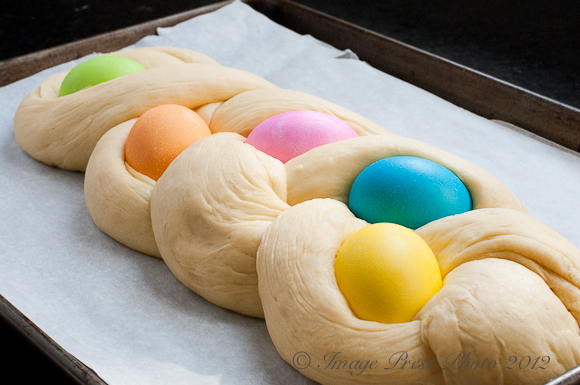 I never ever get sick of looking at Italian Easter bread and yours is so colorful! Stunning, Gwen! I never celebrated Easter and maybe colored eggs once or twice, but I love Easter candy and OUR Easter ritual was to go to the grocery store the morning after Easter and buy up all the Easter candy – the peeps, the candy-coated malted milk balls, the chocolate and the cadbury eggs…. and enjoy! This is one gorgeous, perfect bread and would be fabulous even without the traditional colored eggs. I have to try it. Happy Empty-Nest Easter to you and R! Thank you. Funny how we all had our traditions during Easter. The new outfit was definitely the thing in my world when I was young. My clothing and shoe obsession stems from Easter outfits as well. The shoes were always the most important! They had to be white, shiny and have a heel so that they were noisy when I walked. My shoes are still the most important, but my color preference in shoes has changed and so has the heel height. Easter brings back great memories–thanks for the opportunity to reminisce. Hi I had a question about the eggs … Do you boil them before putting in the bread? I know you due them before but was unclear if them cook in boiling water first then cool to dye and dye and then add them to the bread doug braid?? Hi Jenni, Yes, they are hard cooked (refer to #5 in the directions). I have seen one recipe where they were not cooked and baked with the bread, but I have never tried that, so I don’t know if it really works. Hi. I was wondering how early this bread could be made if kept refridgerated. Thank you so much for shering. I madera it . Easy & Delicioso!!! Watching this recipe I miss my best friend who prepared it for me. By the way I work the tullo, trying food and blogging about it. This recipe is welcome since I don’t have my mom’s, and I love your nod to the 80’s decor traditions- I remember Easter trees!! Thank you for writing and posting this. I hope to make the Easter bread part of my daughter’s holiday memories. I hope you all have a wonderful Easter and that you enjoy the bread! Wow! I made this on a whim Easter morning for an extra bread to accompany my cute butter lamb. I only bake occasionally, so I had low expectations for my attempt. The recipe was so easy, and the bread was delicious. I couldn’t believe that I made something so pretty and tasty! Thank you so much for the recipe. It’s a keeper! !